[Tim Thaler] has been redoing his home, adding some fancy automation here and there. 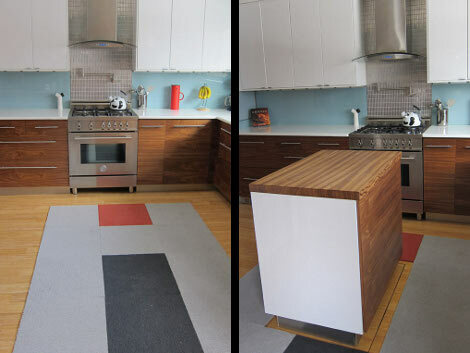 But when it came to the kitchen, he went all-out by installing an iPhone controlled disappearing island. In the video clip after the break you can see [Tim] dial up some extra counter and storage space from his smart phone. One click causes it to slowly rise from the depths, shedding the carpet tiles as it goes. Directly beneath the kitchen is an unfinished storage room. [Tim] framed a hole in the floor above, and sourced a used scissor lift for about $380 to do the heavy lifting. It operates smoothly and isn’t all that loud. It sure makes for an interesting feature if he ever decides to sell the place. We thought it was a nice touch that the storage room hiding the mechanical parts of the hack has a hidden entrance. You must travel through the billiards room in the basement to access it, turning the ball rack to unlatch the entrance.